The catalytic converter is part of the automobile exhaust system. It converts harmful compounds in exhaust into harmless compounds. In a typical vehicle, the catalytic converter, which resembles a muffler in shape, is between the engine and the muffler. It's on the underside of the car, usually underneath the passenger seat. Catalytic converters have been standard on U.S. vehicles since the mid-1970s. Leaded gasoline contaminates the catalyst used inside a catalytic converter, destroying its usefulness and leading to a clogged converter. If your catalytic converter is not functioning properly you may have a problem passing your smog check. 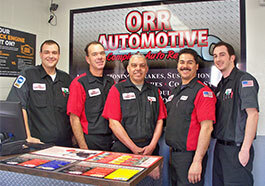 Call Orr Automotive if your engine light is on or if you have a rough idle both could be symptoms of an emissions problem.